The topical anesthetic benzocaine is linked to a number of side effects, ranging from dry skin to allergies. But one effect of this common, over-the-counter medication can be deadly — a blood condition called methemoglobinemia. Benzocaine, a topical anesthetic, is the active ingredient in oral gels, sprays and other products used in everything from bug bite treatments to sexual aids. Until recently, it was also common in over-the-counter medications used to treat teething pain in infants. But the U.S. Food and Drug Administration is warning against using these products in children younger than 2. The agency is also warning adults about the deadly side effect, methemoglobinemia, a blood condition that reduces the oxygen that is delivered to cells in the body. Benzocaine products carry serious risks and provide little to no benefit for treating oral pain. Infants are particularly vulnerable. At least four people, including an infant, have died from the blood condition after being treated with medications containing benzocaine, the FDA said. But far more common is a range of minor, mostly temporary side effects. Most of these arise in the location the benzocaine is applied. Benzocaine products carry a number of side effects other than methemoglobinemia. If you or a loved one develops any of these or other side effects, you should discuss them with your doctor. Some people may experience an allergic reaction to benzocaine. If this happens, get emergency medical help right away. The blood carries oxygen to the cells in the body through a process that employs hemoglobin, a protein in red blood cells. It carries oxygen through the bloodstream. Typically, hemoglobin releases that oxygen to cells in the body. But one type of hemoglobin — methemoglobin — doesn’t release oxygen to the cells. When too much methemoglobin is produced in the body, the cells don’t get enough oxygen. Using the topical anesthetic is linked to an over-production of methemoglobin. Researchers in 2007 documented how a cystic fibrosis patient developed the low-oxygen blood disorder after a double-lung transplant. The 17-year-old suffered complications from the transplant and doctors needed to threat an instrument down his throat to check out his lungs. Benzocaine was sprayed in the patient to alleviate discomfort from the bronchoscope. About 20 minutes later, his skin took on a bluish tone and he had trouble breathing. Those are two symptoms of methemoglobinemia. They found a third. “Of note, the patient’s blood sample appeared to be chocolate-brown in color,” the researchers said in the Journal of Pediatric Health Care. His methemoglobinemia level was more than 20 percent. Doctors administered a chemical called methylene blue – a cure for the blood disorder. His skin color returned to normal 20 minutes later and tests confirmed his blood returned to normal. 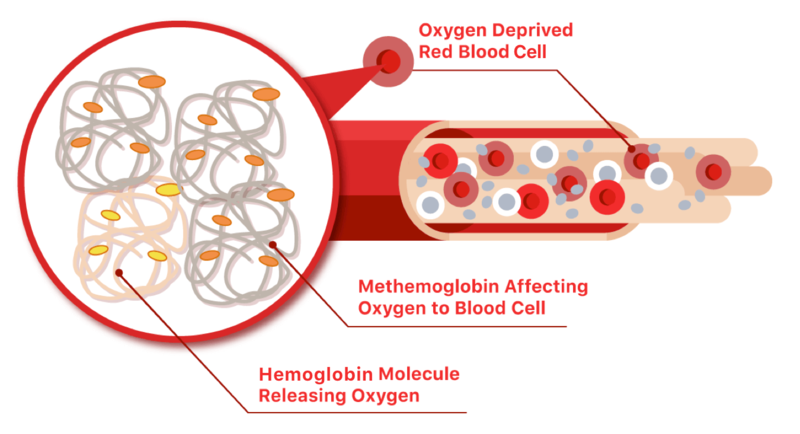 Methemoglobinemia occurs when the amount of oxygen in the blood stream becomes dangerously low. Benzocaine is described as one of the most common causes of acquired methemoglobinemia. Acquired methemoglobinemia is the kind that is not present at birth, as compared to the kind that is present at birth, known as congenital methemoglobinemia. The FDA conducted a study to compare the ability of benzocaine and another local anesthetic, lidocaine, to make methemoglobin. The study showed benzocaine created much more methemoglobin than lidocaine in a red blood cell model. The agency said in 2018 that it had evaluated 119 cases of benzocaine-associated methemoglobinemia. The cases were reported to the FDA and identified in the medical literature between February 2009 and October 2017. 22 occurred in patients younger than 18. 11 were in children under 2. 4 involved patients who died, including one infant. In a different study, researchers examined records of the California Poison Control System for all calls from January 2004 to December 2014. The center received 157 reports of benzocaine exposure in children 17 and younger during that period. “Most cases (88) were caused by unintentional exposures related to exploratory behavior in toddlers,” the 2017 study in the Western Journal of Emergency Medicine said. In most cases, the child wasn’t hurt. Four children suffered major effects. They received methylene blue and supplemental oxygen treatments. “This large case series of benzocaine exposures reported to a statewide poison control system suggests that the wide availability of topical benzocaine products marketed towards pediatric-age populations continues to pose a child health hazard,” researchers concluded. In 2018, the agency told manufacturers to stop promoting products that contain benzocaine for use in infants. The FDA also directed that warnings be placed on labels about the risk of methemoglobinemia. The FDA first warned about the potential danger in 2006. The agency repeated the warning in 2011, 2012 and 2014. Some people are at increased risk of developing the dangerous blood condition with use of the topical anesthetic. For example, the elderly may be more vulnerable. Researchers described one patient — a 56-year-old smoker — with a history of alcohol abuse, seizures, coronary artery disease and chronic obstructive pulmonary disease who had a bad reaction after being treated with benzocaine, lidocaine and intravenous diazepam. She received those treatments before undergoing an esophageal dilatation, which was uneventful. In the recovery room, less an hour after the drug treatment, she became agitated and her oxygen levels dropped. Emergency room doctors administered methylene blue and her condition improved within 10 minutes. “In the case presented, methemoglobinemia was clearly due to the topical local anesthetic, as the only other new agent that the patient received was diazepam, a drug not associated with the condition,” researchers wrote in a 2001 study in Canadian Journal of Emergency Medicine. Symptoms of methemoglobinemia may appear within minutes or up to two hours after using benzocaine. According to the FDA, symptoms may occur after using benzocaine for the first time or after several uses. It can occur even if there is no benzocaine overdose. This condition was detected in a 3-year-old boy who underwent a complication-free endoscopic procedure, according to a 2006 study in Pediatrics. He developed methemoglobinemia from benzocaine spray before the procedure. “His cyanosis and altered mental status promptly resolved after intravenous administration of methylene blue,” the study said. If someone experiences symptoms of methemoglobinemia, they should get emergency help immediately.